I want to wish all of the Step Mothers a happy day today. When I met my husband and found out he had a daughter I thought ok this is fine. It will be great. What I learned is being a step mom is the hardest job in the world. How do I work through the “Who is this lady? Why is she hanging out with us? Who does she think she is? I don’t have to like her. I don’t have to listen to her. She’s not my mom.”? And this is what I dealt with through the communication skills of a 4 year old. I never want to replace her mother. I only want to be a support and a rock for her. I want to teach her how to be independent, confident, to love herself and life. Today, she is a couple weeks from 9 years old and we have come a long way in 5 years. We craft, bake, can, visit museums, go on adventures, watch movies, read books, and laugh together. She has a big heart and today she showed just how big her heart is. 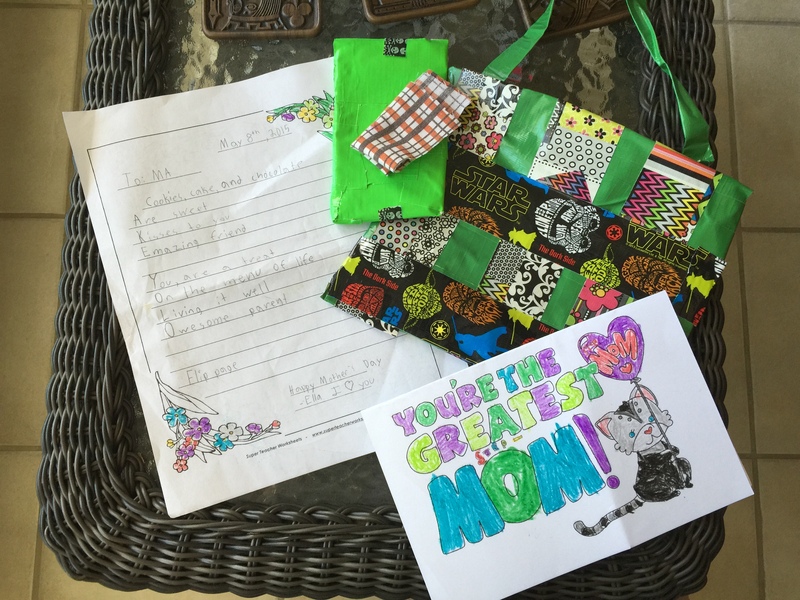 This morning I was greeted with a handmade duct tape purse, a pocket whiteboard, and a poem that made me cry. Her words for me – CAKE, YOLO, LOVE, BEST. I love her more than she will ever know.